“Blessed be the name of Mary, Virgin and Mother." 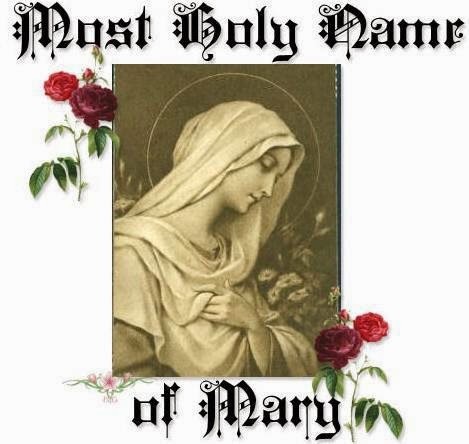 An article worth reading today: Catholic Culture's Most Holy Name of Mary: What's In a Name? The following Litany of the Holy Name of Mary is also from Catholic Culture. Heavenly Father, of Whom Mary is the Daughter, have mercy on us. Eternal Word, of Whom Mary is the Mother, have mercy on us. Holy Spirit, of Whom Mary is the spouse, have mercy on us. Divine Trinity, of Whom Mary is the Handmaid, have mercy on us. Lamb of God, Who takes away the sins of the world, spare us, O Lord Jesus. Lamb of God, Who takes away the sins of the world, graciously hear us, O Lord Jesus. Lamb of God, Who takes away the sins of the world, have mercy on us, O Lord Jesus. I will declare your name unto my brethren. I will praise you in the assembly of the faithful. O Almighty God, Who beholds Thy servants earnestly desiring to place themselves under the shadow of the name and protection of the Most Holy Virgin Mary, grant, we beseech You, that by her charitable intercession, we may be delivered from all evil on earth, and may arrive at everlasting joys in Heaven, through Jesus Christ Our Lord. Amen. "But thou has saved us from them that afflict us, and thou hast put them to shame that hate us." Saint Nicholas of Tolentino had a strong devotion to the church suffering; that is the holy souls in Purgatory. The following is an excerpt from Father F.X Schoppe's book Purgatory. For her [the Church Suffering], he frequently fasted on bread and water, inflicted cruel disciplines upon himself, and wore about his loins a chain of sharp-pointed iron. When the sanctuary was thrown open to him, and his superiors wished to confer the priesthood upon him, he hesitated a long time before that sublime dignity, and nothing could make him decide to receive holy orders but the though that by daily celebrating the Holy Sacrifice he could most efficaciously assist the suffering souls in Purgatory. 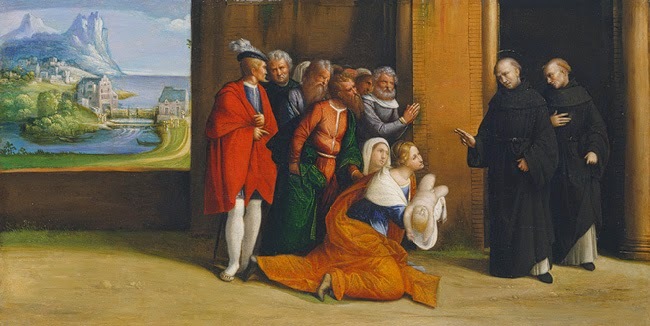 On their part, the souls whom he relieved by so many suffrages appeared to him several times to thank him or to recommend themselves to his charity..."
In honor of his feast day, let us imitate St. Nicholas of Tolentino by remembering the holy souls who may have no one to pray for them relief or release.